First run in 1974 and dominated since 1983 by the faster and more flexible twin-cylinder bikes, the Paris-Dakar rally has always been the field of a bitter battle between twins and single-cylinder machines. It's a situation in which the singles - even if they haven't won - have always performed better overall. The final development of the big singles came in 1987 with the 820cc Suzuki and the Yamaha 750. Even though they were giving away between 10 and 15 hp to the twins, they made it up in terms of weight and manoeuvrability. The Yamaha YZE was the most technically advanced, with a five-valve head and liquid cooling. It quickly proved fast and reliable. Among its novel features were twin fuel tanks - 9.25 gallons at the front, 4.75 gallons at the back. On this bike, Stéphane Peterhansel narrowly missed winning the 1989 Paris- Dakar: the event went instead to the Honda twin ridden by Lalay. But the YZE Yamahas of Picco, Peterhansel, and Neveu finished second, fourth, and fifth. 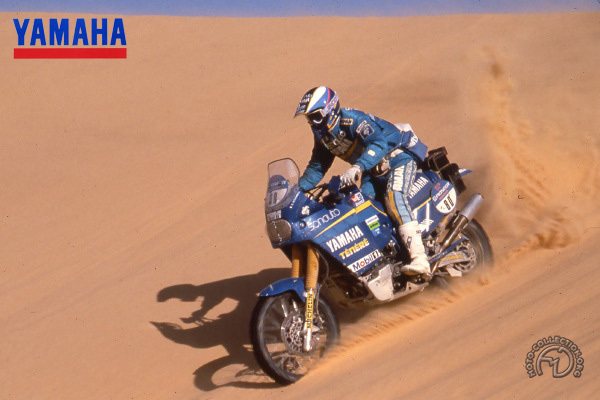 The following year Yamaha also followed the twin- cylinder trend with the racing version of the Super Ténéré, which won the supreme event in 1991. But the big single hadn't entirely lost out, for the production Ténéré 600, which made its debut in 1991, has a power unit that incorporates all the developments first tested on the YZE.